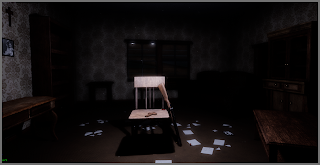 I went back to an older school project from spring '17, and added some polish to it for fun.The class required a static scene built in unreal engine, so i used it for an excuse to practice visual storytelling, i tried to show a narrative with trails of blood, damaged and moved furniture, and the chair facing the open door, as if someone had been waiting for someone or something to come for them. 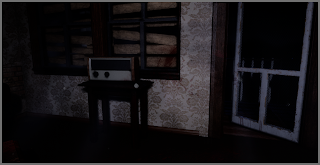 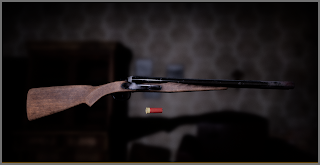 I had some free time, so I fixed up some older uvs, added a grime layer, and more blood. 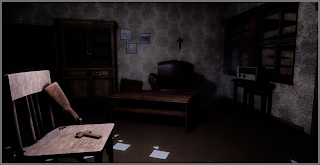 After that i spent more time working on the post processing effects, as those were the weakest part of my original project.